*Movie siren Vonetta McGee, star of such blaxploitation era films as “Shaft in Africa” and “Blacula,” has died. She was 65. The actress, born Lawrence Vonetta McGee in San Francisco, suffered a cardiac arrest on July 9 and died in the hospital last Friday, according to the Los Angeles Times. McGee also starred in 1975’s “The Eiger Sanction” alongside Clint Eastwood, playing the role of Jemima Brown. 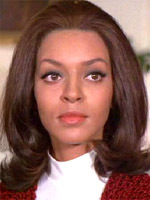 But it was her role two years earlier opposite Richard Roundtree in “Shaft in Africa” that made her a household name. In 1987, McGee married the actor Carl Lumbly; they have one child. According to the Los Angeles Times, McGee was diagnosed with Hodgkin’s lymphoma at the age of 17, although her death was not related to the disease. Read McGee’s entire obituary in the Los Angeles Times here. R.I.P. Beyonce resembles her in that second pic. Too late, she already got that bug with Dream Girls! Vonetta was more of my generation considering her career. I remember her from her work in the early 70’s, but haven’t heard about her lately. I think her pix looks more like Beyonce’s mom. RIP – she was so pretty on film. Gone too soon…..
Didn’t know she was married to Carl Lumbly …or did I forget. I do remember her and Max Julien though. This is the first I’ve heard of her death. We are losing a lot of the old school actors/singers. RIP. Lorraine315, your comment was the very thing I said when I saw the movie. I remember it well, because Vonetta, Pam, & Diane Carol were the only FINE Black Sistah’s getting any real screen time back then. Didn’t know she was married to Carl although. RIP Vonetta! WOW, I remember her very well, RIP sister. Rest in Peace, Mrs. McGee. Not quite sure why it wasn’t listed in this story, I had to goggle Max Julien for the answer, I’m getting old, because I couldn’t for the life of me recall the name of that movie!!!!LOL!!! !